Two plain layering tees for Brit (Wet Seal, I think). A pair of Levi's shorts for Brit. 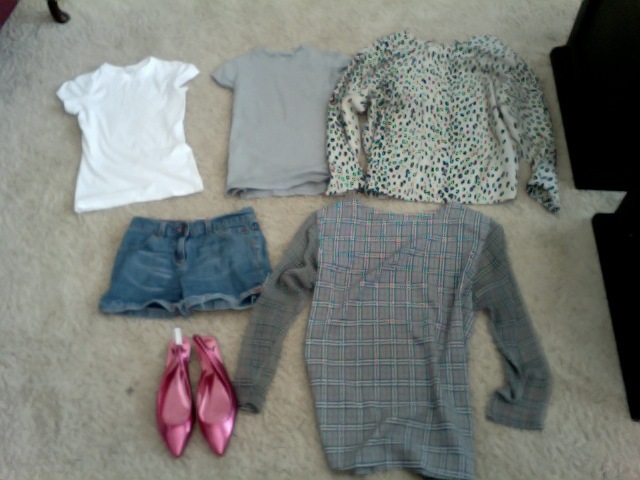 A silk animal print top & a plaid top with sheer sleeves for me. Penny Loves Kenny metallic pink flats. Ooooooooo, I know. My two tops and the shoes I've had my eyes on since mid-June. So, imagine my joy today when the tops were on the 25 cent rack out front. I saw last Tuesday that the shoes had been marked down to a dollar. Since I tried them on in June and knew they fit and have been sitting there, I thought I'd take the risk and see if they went to 50 cents. I didn't go in and do a bunch of hunting, either. I browsed through the few sale racks and that was it. My point is this: FREQUENT YOUR LOCAL THRIFT STORES!!!!!!!!!! but the smaller ones aren't going to move things as fast. You can keep your eyes on stuff and know what's been there for a while. Find out when they make their markdowns and then make your move. (And, fyi, I know it sounds like I'm always making special trips to the thrift store. My favorite one is just down from the pharmacy. How convenient that I can shop while I wait for prescriptions to be filled!